I also made a 4admix Oracle file and a nMonte file, however not all samples are named according to their ethnicity, to look those samples up open the samples file and press cntrl + f to search for the samples which popped up in your oracles/or nMonte runs. This are the biggest Oracle and nMonte files ever made. Last edited by mephisto; 04-02-2018 at 03:36 PM. 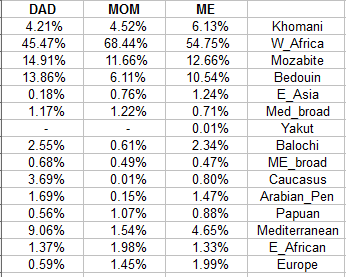 It's really annoying when data sets do not separate Romas from Romanians. Yes, those samples seem to be Romanis. I took the dataset as it was published. I also noticed other strange labelings. Last edited by mephisto; 04-02-2018 at 03:59 PM. To the people wanting to use the files for nMonte: you have to divide your scored value of the various components by 100. As an example: 12,35 (out of the calculator) / 100 = 0,1235, the results is how you should enter the values for the target nMonte file. For admix4 you do not have to do this. Last edited by mephisto; 04-02-2018 at 04:21 PM. For nMonte I think you should use population averages instead of individual results. Does the nMonte suggest a flaw with the calculator?